Cut corn kernels from cobs; reserve kernels. Cut cobs in half crosswise. 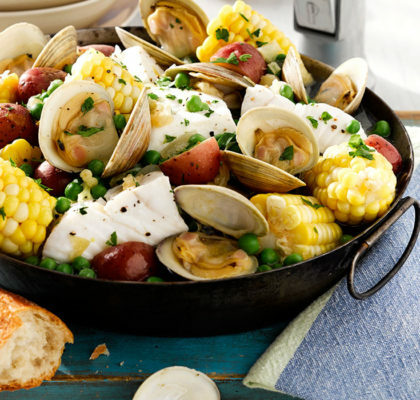 In a medium-sized skillet, over low heat, melt 1 tablespoon of the butter. Add leeks and the corn cob halves; cover and cook until leeks are tender, about 5 minutes. Increase heat to high and add the wine; simmer until reduced by ¾. Remove and discard cobs (wine mixture should measure about ¼ cup). Gradually whisk 3 tablespoons of the remaining butter into wine mixture, 1 tablespoon at a time, along with 1 teaspoon of the thyme. Season with 1⁄8 teaspoon each salt and pepper. Keep sauce warm (in a vacuum container or double boiler) until ready to serve. In a large sauté pan, over low heat, melt the remaining 1 tablespoon butter. Add onion and garlic; cover and cook until tender, about 5 minutes. 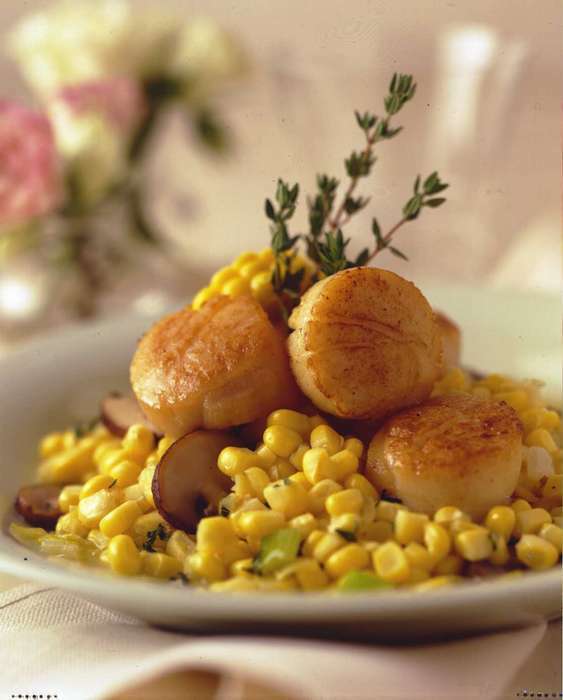 Add corn kernels, mushrooms, and the remaining 1 teaspoon of thyme. Cook and stir until mushrooms are tender, about 5 minutes. Season with ¼ teaspoon salt and 1⁄8 teaspoon pepper. Season scallops with 1⁄8 teaspoon each salt and pepper. In a large sauté pan, over medium-high heat, heat oil. 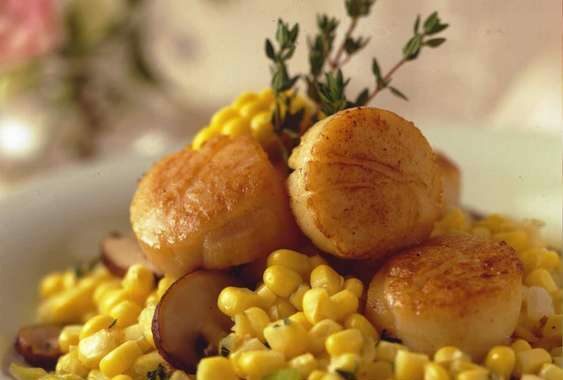 Sauté scallops, 10 at a time, until golden on all sides, about 3 minutes in all. 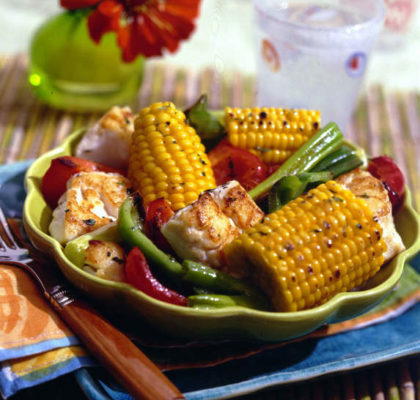 To serve: Arrange corn mixture in centers of 6 serving plates. 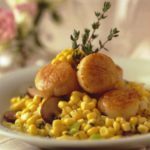 Drizzle sauce around corn mixture; top with scallops. Garnish with fresh thyme sprigs, if desired. 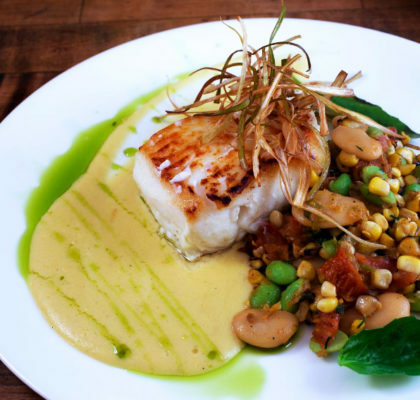 A sautéed corn ragout serves as a sweet base for pan-seared scallops. The average ear of corn has 800 kernels in 16 rows.